All the ingredients of the 72V upgrade have been discussed already in this blog and others like it, as well as in places like the Electric Motoring Forum. But a lot of people just want the ‘recipe’ in one convenient chunk. It’s not actually quite as simple as this as there are subtly different ways of solving some of the problems confronted by upgrading to a 72V system. There are also many different opportunities to reconfigure the existing system, or to add new features, such as regenerative braking or cruise control. You will want to decide how far you want to go with this upgrade, and how important it is for you to preserve things like range while adding the extra power needed to make it act more like a ‘proper’ bike. The first thing you should do is upgrade the power cables with something a little more substantial. You don’t have to do this if you’re using just a basic 72V controller, but I would recommend it, as the existing wiring on the 48V bikes is a bit flimsy. The thicker the cables, the less resistance there will be in the system, and the more current can be drawn without the risk over-heating. Upgrading the cables in this way means better performance and one less bottle-neck in the system; it also means you’ll be able to use any controller you want, and draw as much current as the motor is capable of handling (and then some). If you just want to get up and running quickly with a basic controller, then you can skip this part and come back to it later if you upgrade to a better one, but my instructions on fitting the controller assume that you’ve done this, and that you’ve included an anderson connector in your new arrangement. If you want to skip this part of the work, you’ll have to improvise a little to take this into account. If you’ve committed yourself to the upgrade and already ordered the parts you’ll need, this is a good thing to spend time on while you’re waiting for them to arrive. That way you can have all the cables needed for the existing and extended battery system ready for when it comes time to wire in the controller. You can also have the main part of the work (the controller) done in a single evening, so you’re not off-the-road for too long. To actually charge the new battery bank, you’ll also need a 72V charger. These can be found on eBay but will probably have to be ordered from China. my shop now does a 72V charger suitable for this purpose. eBay has many merchants selling stock, budget controllers, most of which appear identical, but usually need to be ordered from China and have little if any documentation. If you definitely want regenerative braking, though, it’s best to stick with the well documented (but more expensive) Lyen’s “Extreme Modder” Edition (reviewed here and here) or e-crazyman controller, as these can include a programmable interface so that they can be set up with the right regen voltage for the Ego Scoota. If you expect to be relying heavily on your bike, then it might be worthwhile getting an extra, cheap one as a spare. That way you can be up and running quickly if this essential unit breaks down. The connectors on the controller will also need changing to some degree to make them compatible with the bike. If the phase wires don’t come with 6mm ring connectors then these will need to be added, and the power wires will need to be hooked up to an Anderson connector which can accommodate the thicker cable we’ll be using on the battery bank. 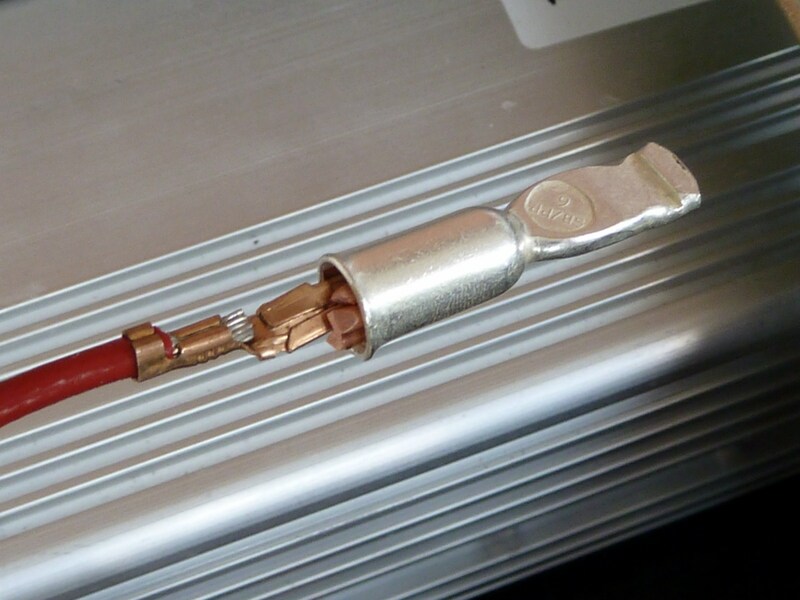 A two-pin mini-connector will also be needed for the brake cut-off and power-feed wires on the Ego’s loom. 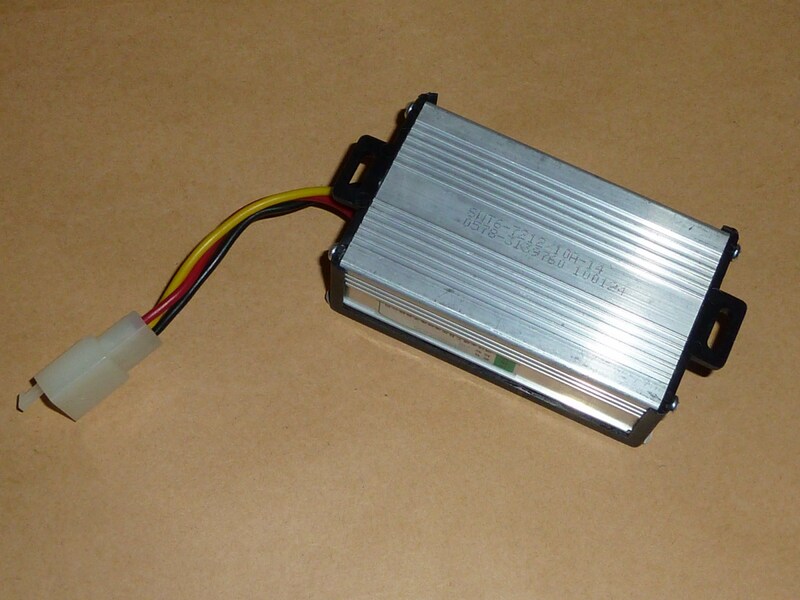 Once you upgrade to 72V, the 48-12V converter that provides power to the 12V system for the headlights, indicators etc. will no longer work. The crucial connector Bk/Y/R that converts the full battery bank voltage into 12V will need to be served by something else. Quality 72V versions of these (they will actually allow any input from 20-90V) are now available from my shop. 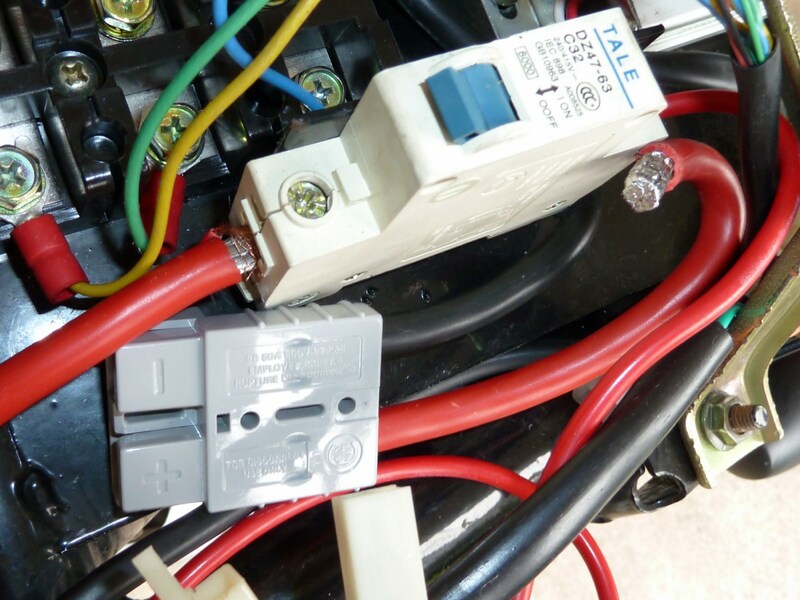 The unit has exactly the same connector as the 48V converter that comes with the bike, and can therefore be mounted ‘plug and play’ in the same position as the old one. Since it can function with the original 48V input voltage, it is also a good place to start for an upgrade as it will still work fine with the original battery bank. Alternatively you can use Mike’s recipe to modify a PSU for this purpose, but bear in mind there can be complications (as with myself) when the polarity of the unit varies, and you can end up with -12V instead of +12V coming off the final product. 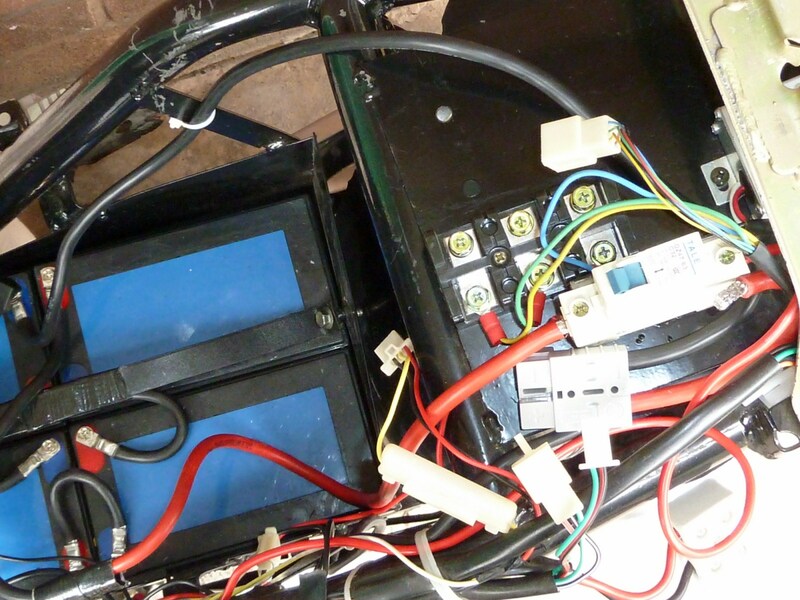 This will require a couple of wires switching – the 12V and the ground. If you don’t have a suitable converter available, you can set up a workaround by simply powering the 12V system from a single battery, either a separate one, or an existing bank-battery. Bear in mind, though, that this battery will go out of balance more easily with prolonged use and may require topping up. But this is easy enough to do through a homemade connector that can allow you to charge the battery from the connector that hooks it up to the loom. Out of these alternatives, I’d recommend the replacement 72V converter available from my shop, as it’s built for this specific purpose, is as cheap as (if not cheaper than) the PSU-based solution and is also much more energy-efficient. Another problem is that the Battery Meter will no longer function. There are three main ways that people take care of this. One solution involves running a lead off of the positive terminal of Battery 4 to provide the 48V that the existing meter requires. However this solution also requires a relay to be attached so that the 48V is only applied when the ignition is on. Another solution is to use a zener diode to drop the voltage of the battery meter terminal on the upgraded system back down to the 48V required. The third solution is the route I opted for, which is to simply replace the existing battery meter for a better unit. I collaborated with Sparklight Products to customise their 6-LED, 12-state battery meter and bring it out as a kit suitable for the Ego Scoota. This kit is available in 48V, 60V and 72V form. The meter is much better than the existing one, and very affordable (a tenner plus change). If you like tinkering around, and don’t mind the work involved in refitting the meter then this is probably the solution for you. If you go through all five parts of this in order, it should be hard to go wrong. With the availability of the Thunderstruck 72-12V converter unit, 4.2.2 can be skipped if you take this route. Regenerative braking isn’t covered as yet, but that will probably be coming soon. Remember to get a Lyen’s “Extreme Modder” Edition or e-crazyman controller if you definitely want that feature, as most cheap controllers don’t support this feature or explain how to make it work. At this point you should have upgraded your power cables with the nice thick welding cable or at least something better than what was there before. You will also have the four cables you were left with; two to string the batteries together, and the remaining ones that go from the master terminals to the Anderson connector that will serve power to the controller. 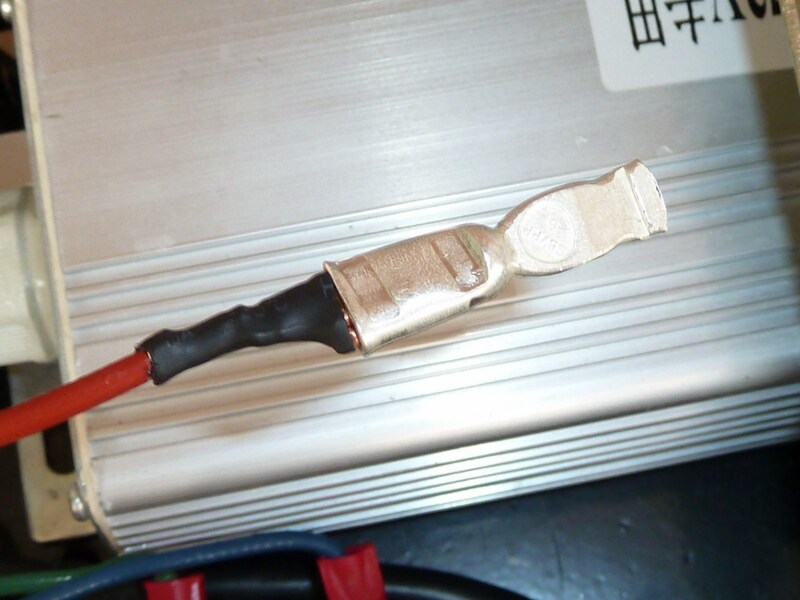 If you built a DIY 72V adaptor then you will also have this, or a suitable substitute. 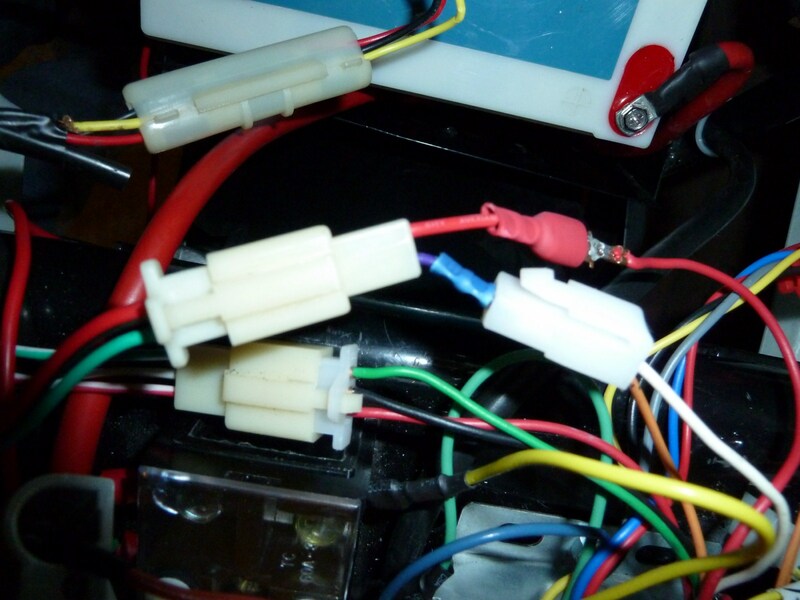 If you just want to rig the 12V system up to one of the batteries for now, then you’ll need a cable composed of a three-way connector rigged up to two 6mm ring connectors. You will also have the two extra batteries and all the other parts listed. You will also have checked the connectors on the controller and added the Anderson connector, a two-way mini-connector, and – if necessary – ring connectors to the phase wires. If you’ve just cut your hole and intend to go straight on to the main job of fitting the new controller, then don’t bother bolting the seat back on just yet. It’s best to leave it until the new arrangement has been tested ‘loose’, so that everything can be easily accessed if something needs fixing. It can all be put back together nicely when we know it all works as it should. The first thing to do is remove the old controller. A single bolt at the front, and a clip to the rear should be securing it to its mount. Next disconnect the three phase-wires from the three-way (six terminal) junction box, unplug the hall sensor connector, brake connector and throttle connector, and then disconnect the main black/red feed wires from their terminals on the 2-way ceramic block. The next thing your need to do is wire in the big cable you built with that Anderson connector at the end. This is the main power feed for the motor. The black connector goes from the master negative terminal (top left) to somewhere near the 2-way ceramic block (just by the breaker switch) where the old power terminals are located. The red, positive lead goes straight from the output (ON/OFF) side of the breaker switch to the Anderson connector. This will power the new controller’s main motor-feed circuit. The ceramic block will no longer be needed, as power to the controller will be taken from this new line instead. Why are We re-wiring this Bit? 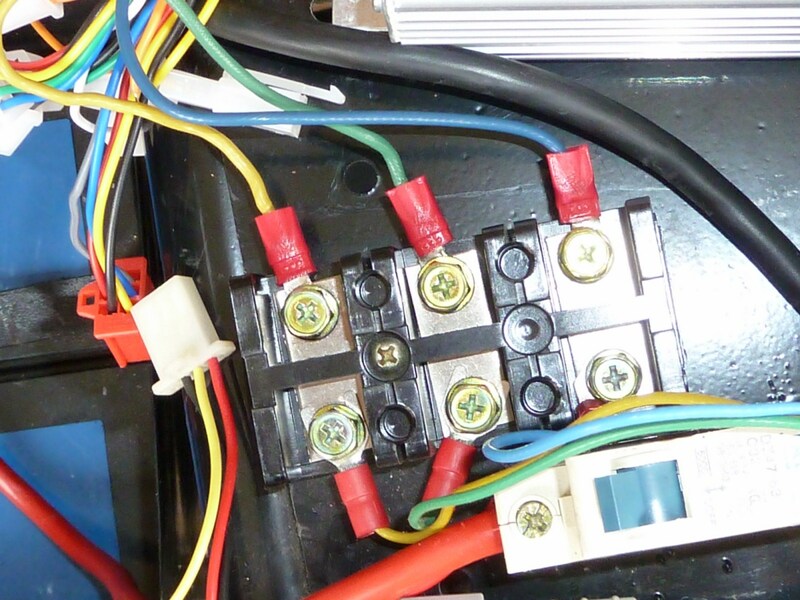 If you look at the output of the breaker switch on the existing system, you’ll see one main, red power wire leave the breaker and enter the loom. This wire then loops back up the loom alongside a black ground wire, and re-emerges at the top to join with that ceramic block which currently powers the controller. However it turns out that the length of wiring inside the loom breaks off to serve the ignition, so you can’t just dispense with this length altogether. The main power cable of our new arrangement, though, really doesn’t need to go all the way round to where it serves the ignition feed. It makes more sense to break our power feed away earlier, and take it directly from the breaker switch to the Anderson connector. It doesn’t affect the actual connectivity of the system doing it this way, provide we retain the length of wire up to the ignition feed and back to its earth-source. So the first thing to remember, here, is that the red wire going from the breaker into the loom must remain, as must the black wire that goes from the master negative and up into the loom. 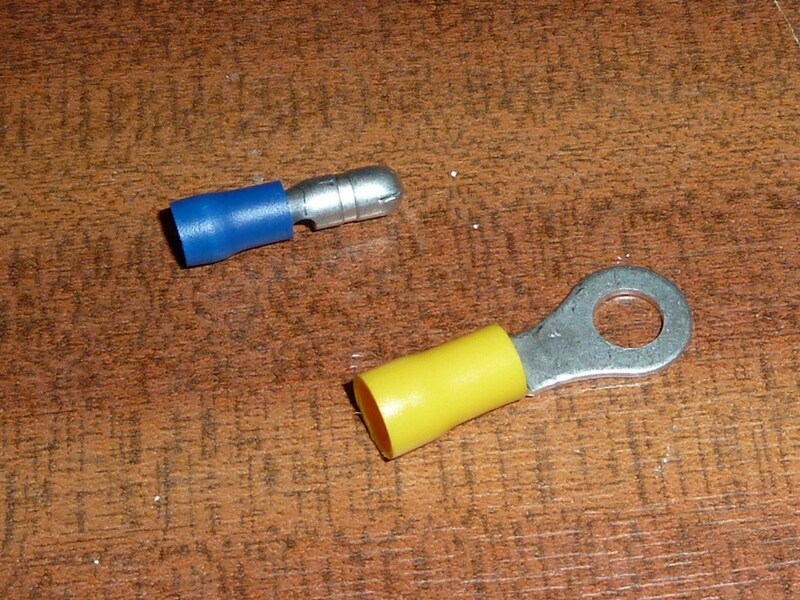 These are both needed for the ignition circuit – DO NOT REMOVE THESE. However you can remove the ceramic block, and cut off its two R/Bk wires where they emerge from the loom, as below. This all done, you should be ready to add the new batteries to complete the 72V bank, and wire in the new controller. 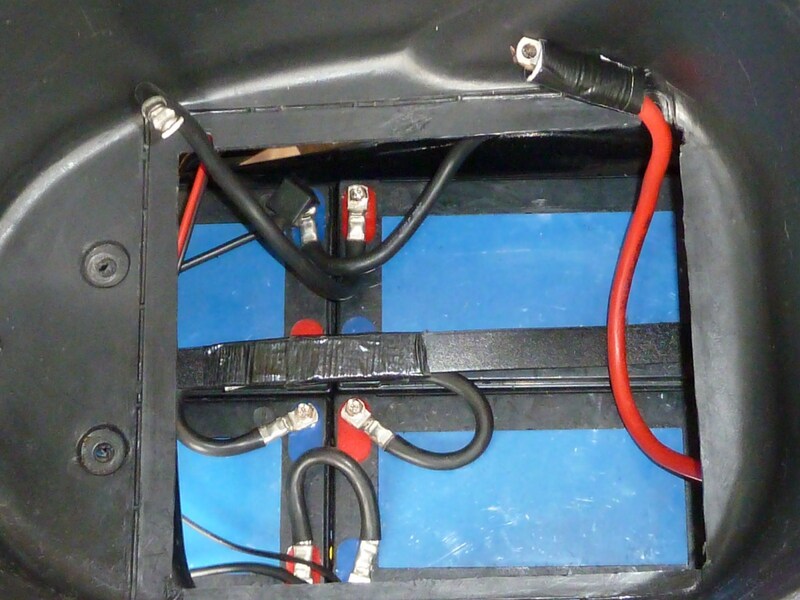 You can now wire the new 72V battery bank together. Be careful here, and think carefully about what you connect to what. If you have any doubts, use your multimeter to figure out where you are. Keep the breaker switch OFF until you’re ready to test the new configuration, but don’t be lulled into a false sense of security as you wire up that battery bank. 72V might not be lethal, but it can spray you with sparks and molten metal if you get things wrong. When you’re ready, turn the breaker switch to the ON position and take multimeter readings to confirm that 72V is being delivered to the bike’s system. If you built the DIY 72V-12V converter then now is the time to test it. Hook it up to the R/Y/Bk three-way mini-connector on the bike’s loom that used to host the old adaptor and switch on the ignition. The green light should glow dimly and the electrics should work as they did before. At this point you might also want to test the indicators; if the polarity on the DIY unit is wrong (-12V rather than +12V) then the blinker unit won’t work and the indicators will fail. If you bought the 72V-12V converter (as I’d recommend for this upgrade), then you just replace the existing 48V converter with this instead. 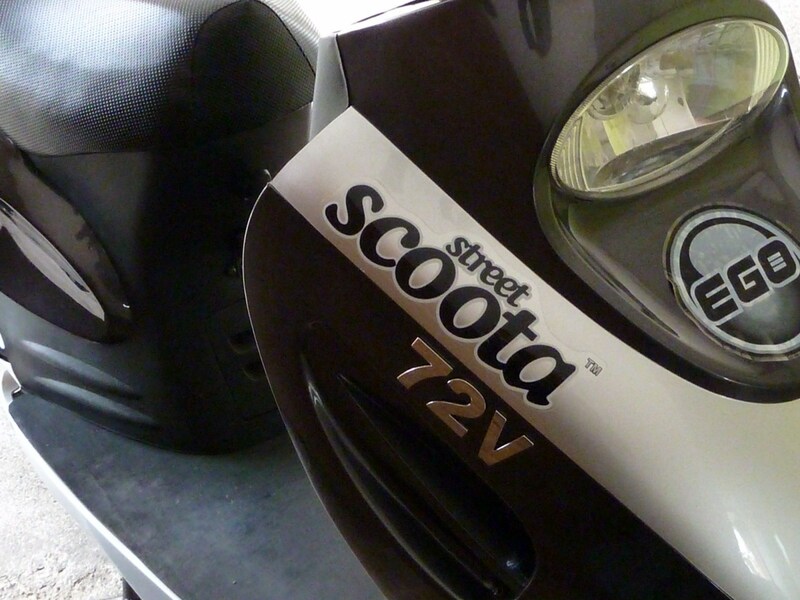 In fact, since the converter will run off of 20-72V, you can replace this as the first part of the upgrade, as it should still work with the scooter in its original 48V configuration. All that remains now is to wire in the controller to its corresponding connectors on the loom. You might want to leave the controller ‘loose’ as you connect up the cables and figure out how to physically route them all round to where they need to be. Then you can bolt the controller in properly once everything is working. Turn the breaker switch back to OFF until all your connectors are properly hooked up. This is straightforward enough. In the last section you should have attached all the right connectors to the Controller, including the Anderson for the main motor power. This now just plugs into the Anderson connector on the loom: Just make sure you have the black/red wires the right way round. The three Bl/Gr/Y phase wires just hook up to the big three-way junction where the old ones went. Colours seem to be standardised as far as these connectors are concerned, but there are rumours that these sometimes need reversing to make things work. I have yet to see this problem, so start with checking the throttle connector if things don’t start up straight away, as this is often the culprit. Once you’ve connected the phase wires, check the six-pin Hall sensor connector (Bl/Gr/Y/Bl/R) on the new controller and plug that into its counterpart on the loom. On both controllers I’ve had, there has never been an issue with this connector. On the new controller, you simply connect up the two-way R/W connector you attached for the brake/power feed, along with the new R/Bk/Gr throttle connector. 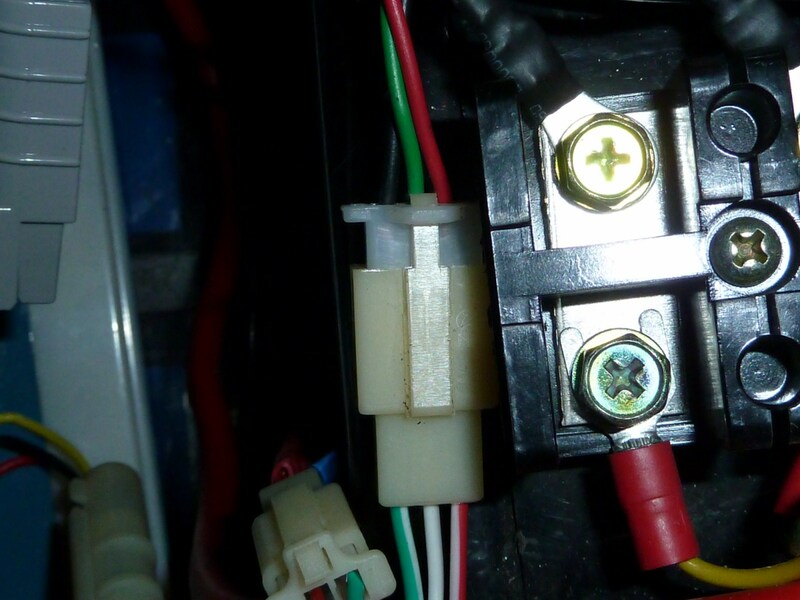 For the two-way brake/’ignition’connector (below right), the green from the bike’s loom (which comes off of the brake-light circuit), goes to the white wire on the controller. The red wire on the loom (which comes from 72V circuit) goes to the thin red wire on the controller. If you have any doubts about the which wires from your bike go where, then measure them with a multimeter. The red 72V wire should measure 70-76V or so when the ignition switch is ‘on’. 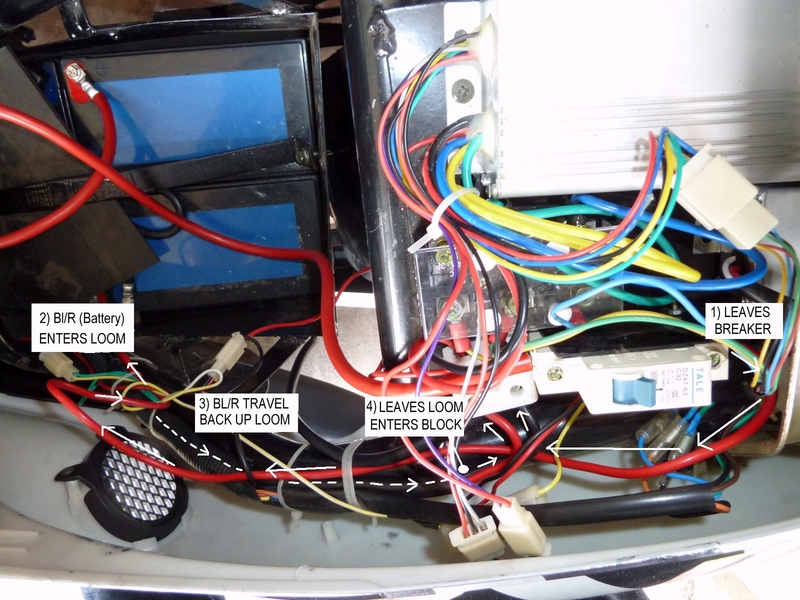 The green wire should measure around 12V when the brake is operated or the sidestand switch is activated. For the three-way throttle connector, you need to MAKE SURE THE THROTTLE CONNECTOR WIRES MATCH UP! The colours either side should all match (though the ones on the loom may have a white stripe as below). The red, black and green wires on one side of the connector should meet the red, black and green wires on the other side. If they don’t match, then pick them and swap them round on the controller side. Once everything is connected up okay, you can turn on the breaker switch and see if it all works. This is the moment you’ve been waiting for. But don’t panic too much if nothing happens right away, as you probably forgot something basic. First check that the bike is firmly on its stand with the rear wheel raised clear of the ground. Turn the ignition key and gently turn the throttle. If the motor whirrs to life, then congratulations, you evidently did everything right. Squeeze the brake at the same time as the throttle to make sure the throttle cut-off works (the brake should cut off power to the motor). 1) Do one more check of the voltage on the main power wires. Is power actually getting through to the controller? Is there any power at all? Are the batteries all wired up properly, with no breaks in the circuit? 2) Is the brake light on? If so, did you perhaps leave the side-stand slightly down so that the brake cut-off is in operation? 3) Are you sure that THROTTLE CONNECTOR is properly wired up? If you checked all of these things and are still having no joy, then you might have bought a dead controller and may need to return it. Did you buy a spare? If so, you can try that one too. If not, then you’re out of luck and will need to ‘revert’ to 48V mode until you can figure out what’s up. If you just can’t figure out what the problem is, then you can post a message here or to the Electric Motoring Forum. The next thing to do is prepare the connectors on the new controller so that they can connect securely to the bike’s system. Your controller should be something like the one below. For the upgrade we only need concern ourselves with connectors A-F. You can forget about connectors H, J, K, though if you want cruise-control, you could wire G into one of your horn buttons (the one you don’t use). This is really the most important connection of the whole bike. 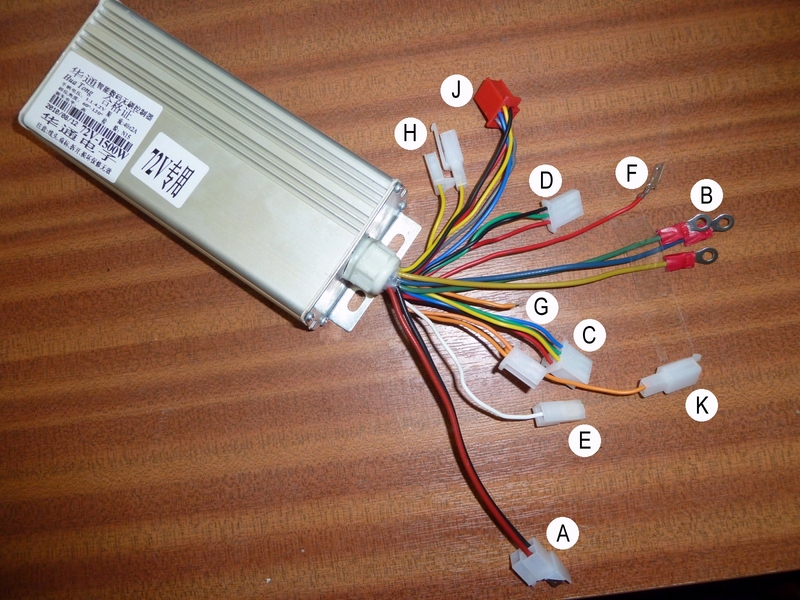 However the wires from the controller are quite a bit thinner than the crimps for the Anderson connector, so – like others in the Electric Motoring Forum – I elected to ‘double-crimp’ these by using the existing connectors on the wires as ‘fodder’ for the larger crimps. Here’s the main motor power cable as it came on my controller. 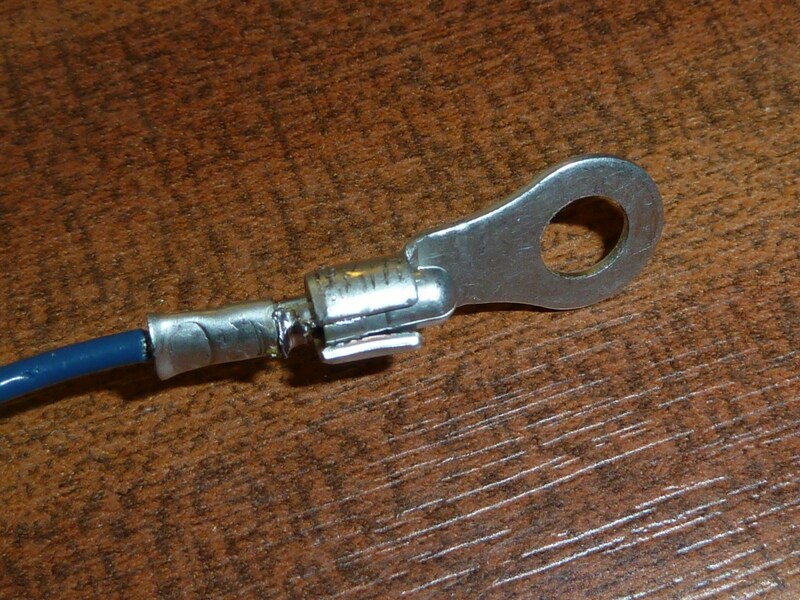 It came as one of three spade connectors housed in a triangular-style three-pin plug with the ground and the low-current feed-wire for the controller. Since this connector isn’t in use on our bike, it needed dismantling into its component wires. This and the black (ground) wire need to be crimped into an Anderson Connector to connect with the one served by the main power cables on the bike. The low-current wire (the other red wire, F) will be connected up to the two-pin mini connector that also takes the the brake wire. 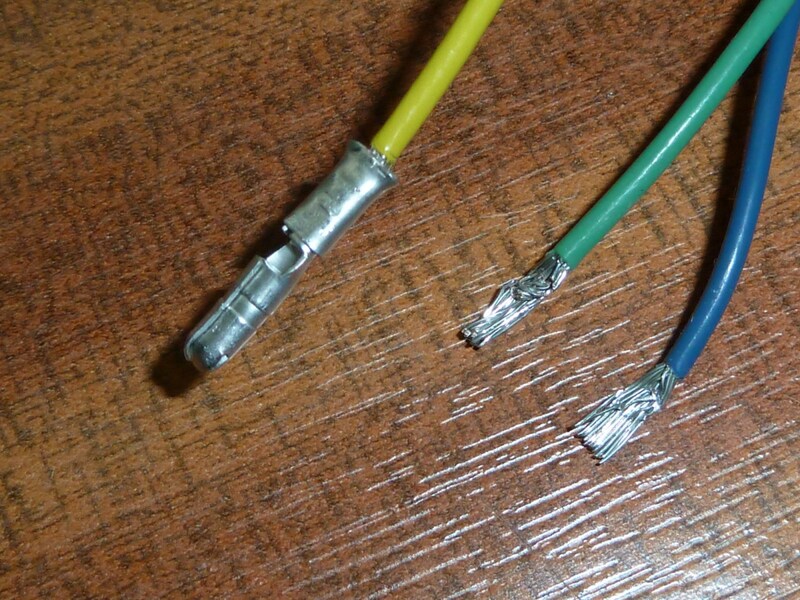 If you have different connectors on your power leads you can still use this method – or a variation – to good effect. 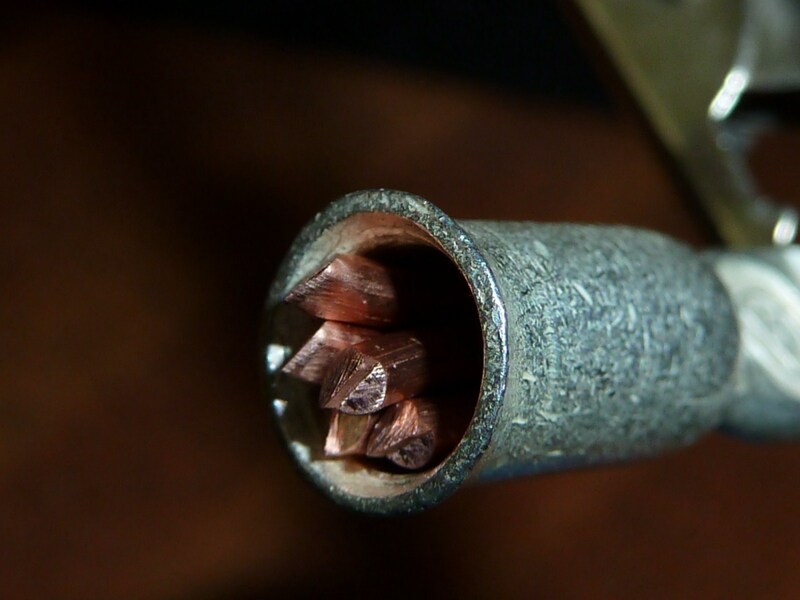 If you have bare wires, you could crimp/solder them onto bullet connectors first, as with the instructions for the phase wires. First I just folded over the spade so it fits inside the Anderson crimp. 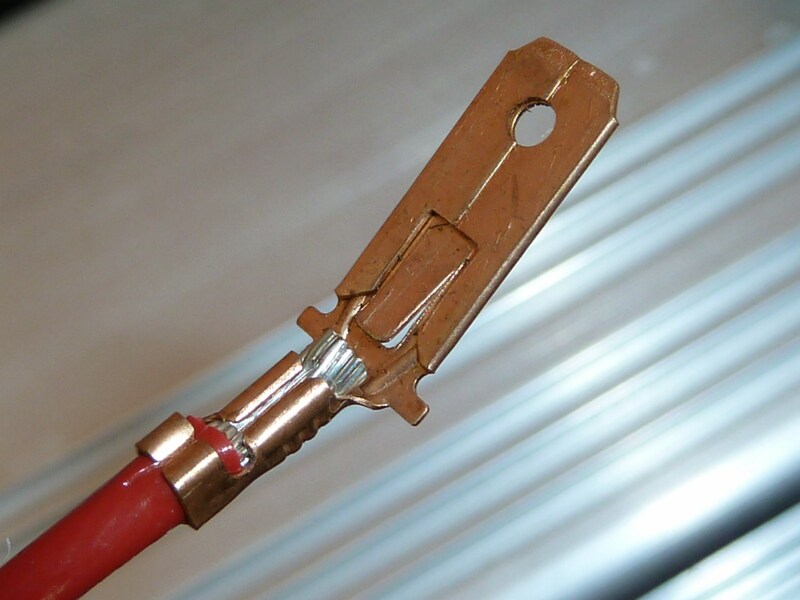 To pad out the crimp for a tight fit, I’ve used 10mm lengths of thick copper wire I took from an old cooker cable. I pack the spade connector in with this ‘filler’ then crimp it for a good solid connection. 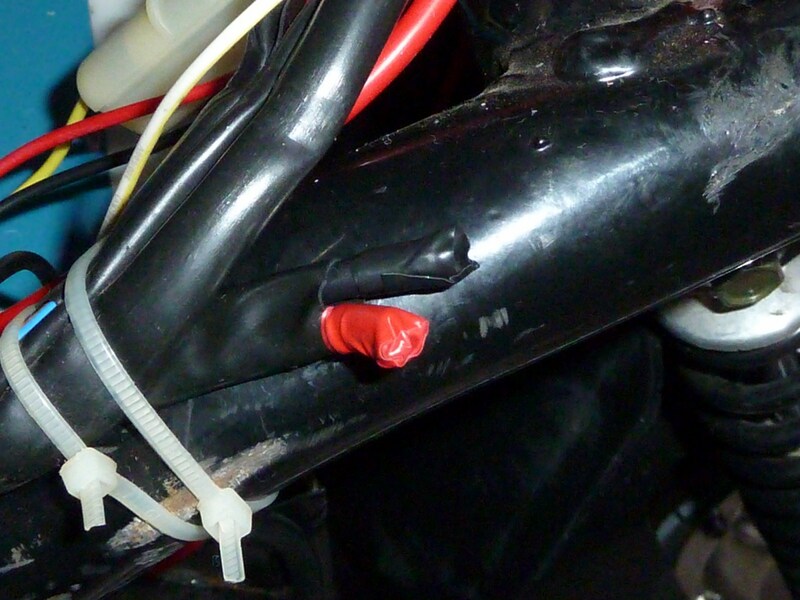 Next a bit of heat-shrink for insulation before it is clipped into its Anderson connector along with the black ground-wire. The Anderson connector for the controller (left) is now ready to be joined with its counterpoint on the loom. The Anderson Connector (left) for the controller power cables, connected to its counterpart (right) which takes power from the main battery bank via the breaker switch. On the Ego Scoota, the white brake cut-off wire (E) and the red power feed (F) to the controller both need to hook up to the R/Gr female 2-pin that served the R/Vi wires on the old 48V controller. You therefore need to wire these in to the male two-pin mini-connector listed in the parts. If you’re desperate, you can just take the one off the old controller, but it’s nicer to just use a fresh one, as whoever inherits your old controller won’t be too happy. The final arrangement for the brake/power feed wires: A two-pin connector replaces the red/violet two-way that ran from the old 48V controller, and which now holds the equivalent red/white connections from the 72V controller. If you’re lucky, the phase wires on the controller you have will already have ring connectors. And if you are even luckier, the holes will be big enough that you won’t have to drill them out (beware!) or just replace them. 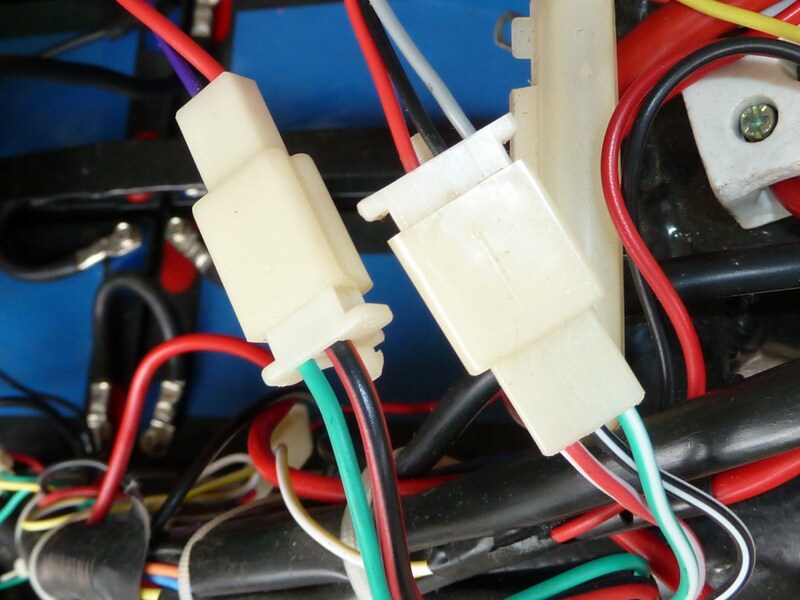 However if you are left with just some bare wires, you might be wondering how to give these a solid connection to the large-bored ring connectors you’ll need for the connecting block on the Scoota. 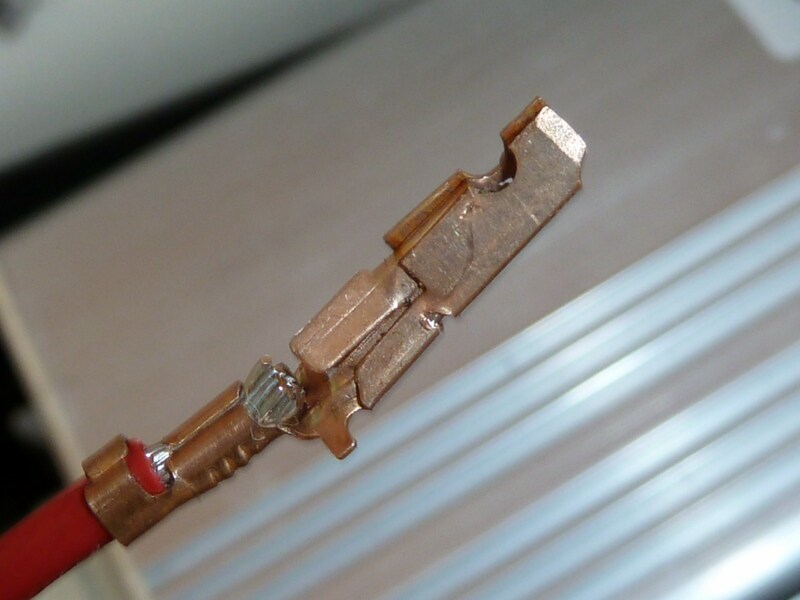 The smallish guage phase wires are way too small to suit the large bore of a standard 6mm ring connector. However they are just the right size, for one of the many bullet connectors I got in my handy megapack of connectors. which is great if you want to add a smidgeon of solder to the resulting crimp, like I did, to make sure the connection is as solid as possible. With the phase wire bullet connection duly crimped and soldered, I then shoved it into the bore of the 6mm ring connector (not forgetting to slide a length of heat-shrink down the wire first). Next I used the honking great crimper to crush it into a nice, solidly fused mass, then packed the heatshrink around the resulting join. 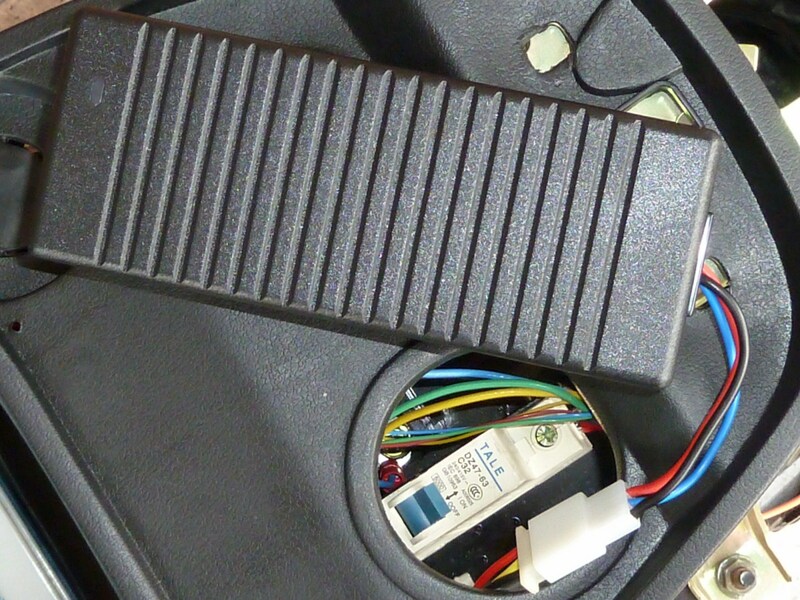 The throttle connector on the controller should be a 3-way mini-connector just like the one on the loom. However you need to check this as the wires are frequently reversed, as below on my chatparts.com controller. Watch out for that hinky throttle connection! 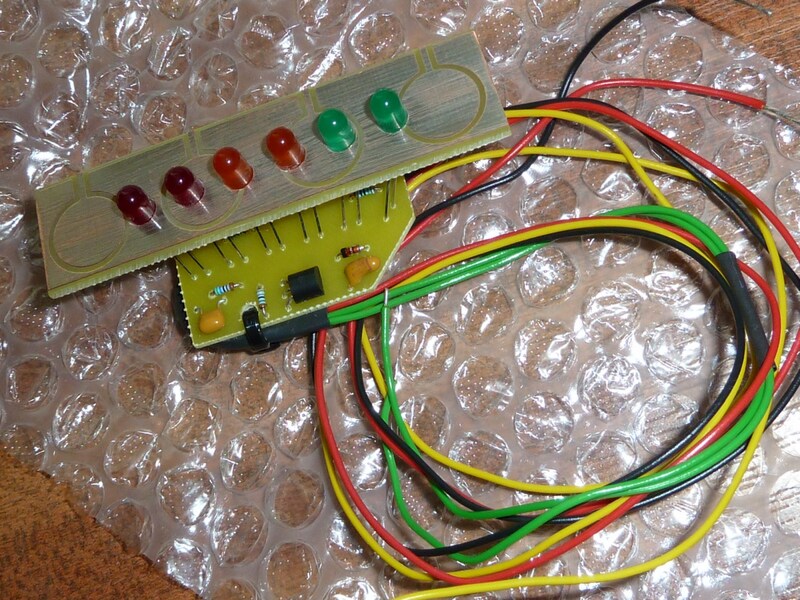 The Green(/White) – Black(/White) – Red(/White) throttle connector on the loom (bottom), corresponded to the Black-Green-Red on the controller’s own connector (top). This should be Green-Black-Red, NOT Black-Green-Red, so that they match their counterparts on the loom. On both of the controllers I have used, the black and green wires on the controller’s three-way connector needed ‘picking’ so that these wires could be reversed. The problem, of course, may not take this form on every machine, or even exist at all, but whatever your configuration you need to make sure that the colours match up either side of the connectors. Once you’ve got these four sets of connectors checked or fixed, the controller will be ready to attach to bike in the next section Installing the 72V Controller. The first thing to do to do for the upgrade is to prepare the bike for its two extra batteries. The underseat space – as well as providing storage space for luggage – is also an ideal location for the extra batteries, and the makers designed the underseat compartment with this in mind. 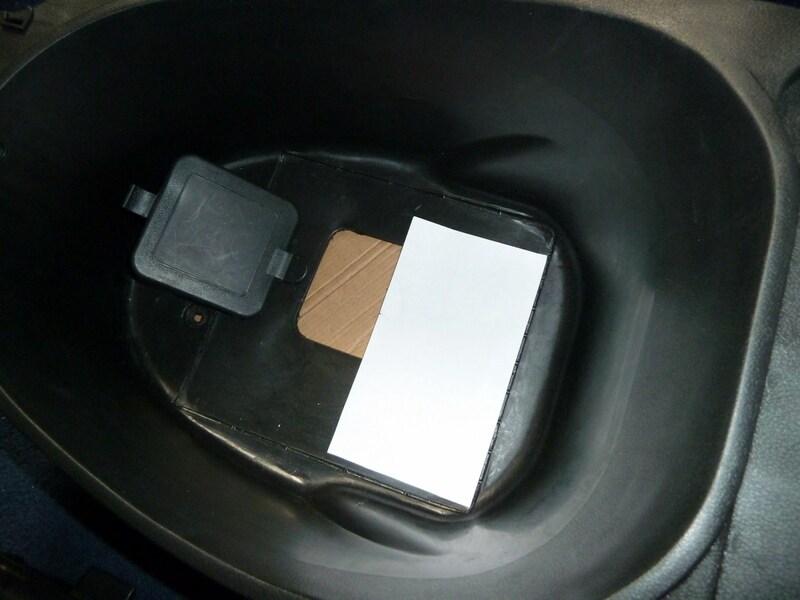 A hole can be cut in its base to house two extra batteries such that they rest on top of the existing battery bank. 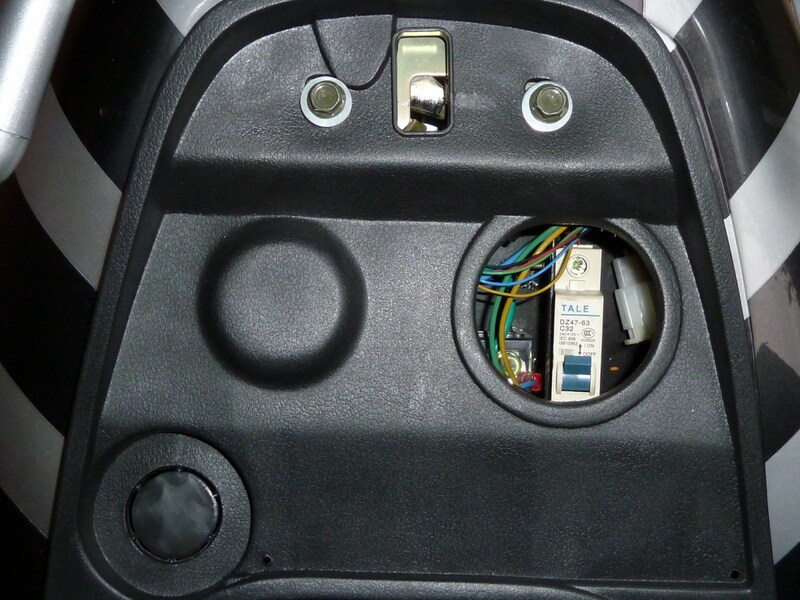 This means, of course, that you need to remove the seat and cut a hole in it to accommodate the extra batteries. The seat is attached by two flanged, hex-head bolts front and rear, and one phillips head screw. First remove these and put them somewhere safe. 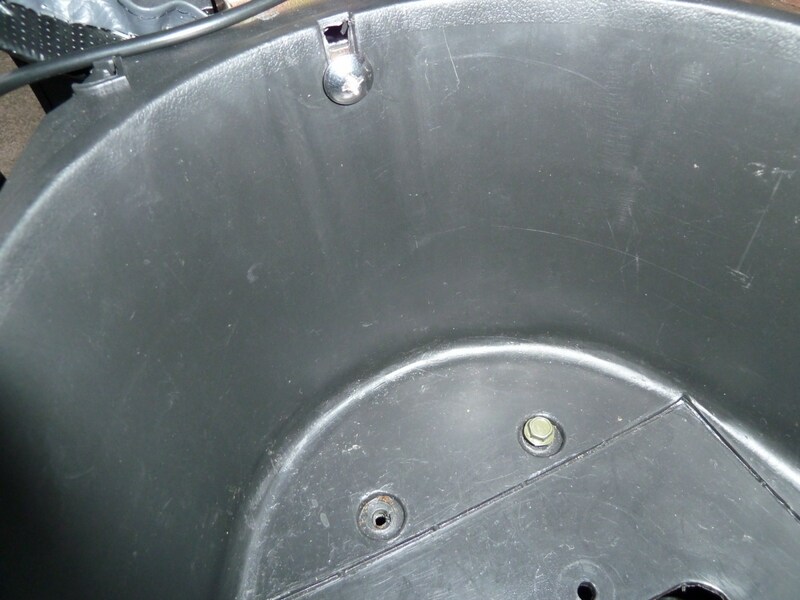 The seat is held onto the enclosure by one bolt that comprises its hinge. 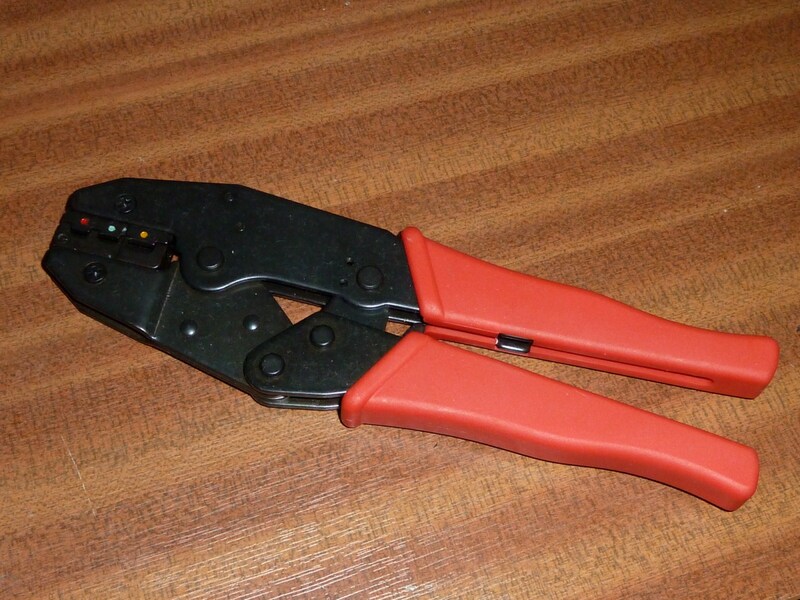 It is best to remove this while you are cutting the hole, as it makes the work much easier. Put your batteries together on a piece of paper and use them to trace an outline. Then cut out the square you marked out. 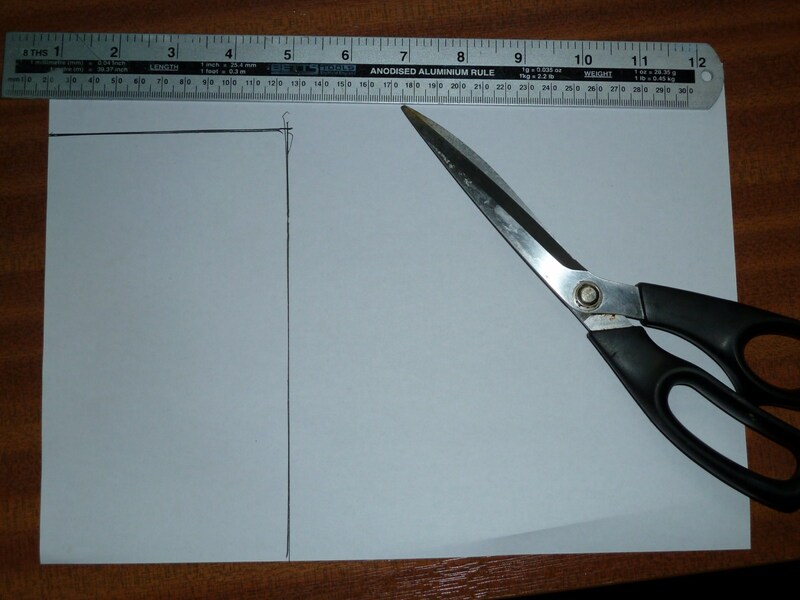 This can be used as a template to mark the area of the seat enclosure that needs to be cut out. The underseat enclosure already has a groove cut into it as a guide for cutting a hole for two batteries (for a 72V upgrade). I made one side of my hole run along this groove, as it made cutting easier. I’ve not used the whole length they suggested though, as I wanted my battery to be a very snug fit so it doesn’t rattle around. 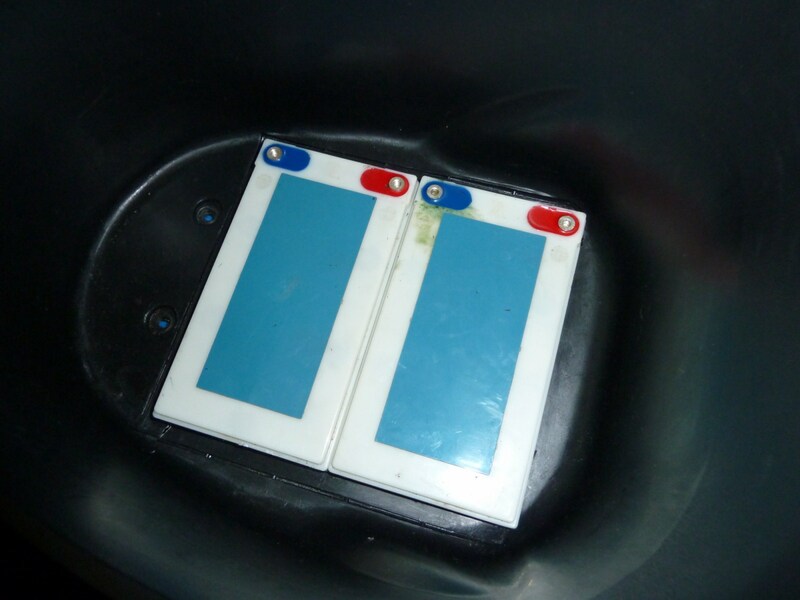 The photo below is one I took for my 60V upgrade, so the template is just for one battery. Imagine a piece of paper twice the width. Mark it with a ruler and pen, or just score lines along with the blade of your knife as a guide to where you need to cut. Then carefully cut through the plastic with a fresh, sharp blade. The plastic is tough, so be patient. Once done, test it for fit and adjust the hole until it’s nice and snug, but not so snug that it’s a struggle to get the batteries through. At this point it’s a good idea to also make two 6mm notches at the corners of the hole by the new bank’s master terminals either side. This will give you somewhere to feed the cables from the main battery bank below. That done, you can put the seat back together and reattach it to the bike in preparation for the main work in Installing the 72V Controller. I’ve been meaning to do it for some time now, to make a ‘proper trip’ that spanned the void between my little town and the bustling metropolis of neighbouring Nottingham, but it was only this Sunday last that I finally decided to brave the trip on the ‘new’ bike. Armed with my custom-built, 12-state battery meter, it would also give me some measure of the range of my upgraded beast, and answer some questions about the effect of the new 72V configuration on the bike’s range. As usual, I decided that I’d drop in on an old biker friend of mine, Dave, from my Sneinton days , but unable to find his phone number I thought I’d just drop by without warning and hope for the best. I’d taken with me a little gift, a framed picture I took back in ’05 of him and his recently departed and much loved Staffordshire Bull Terrier Rufus, both pictured standing in front of Nottingham Castle one sunny afternoon. The weather was sunny but blustery, and there was a marked chill in the morning breeze as I set out at just past 10.00 a.m. to embark on my epic 16 mile voyage. I had little doubt that the bike would probably struggle to make the full round trip on a single charge, so I took with me the charger and an extension lead, knowing full well that once I’d caught him in, Dave would be more than happy to hook me up for a recharge, while no doubt fiercely mocking my new acquisition as he proudly polished his beautiful Harley Davidson. I had already, some while ago, contructed a little laminated logo to denote “Electric Vehicle” that I hoped most people would be able to decrypt with relative ease. I’d mounted it proudly under the license plate both as an announcement of my green credentials, but also as a warning to expect some slightly different behaviour, such as the near-silence of the engine and its far from blistering acceleration on the route’s many hill-starts. The journey seemed so much longer than I remember it being in a car or on a ‘proper’ motorbike, but, well, that’s a moped for you – great as a local runabout, but not so fit for the open road out of town. Still, my new 40mph top-speed meant the journey wasn’t too painful, and most of the inevitable overtaking I was subjected to in the national speed-limit zone was done in a reasonably civilised way, even when those solid white lines punctuating the winding country road forced drivers to occasionally have to hang back single-file and be patient. The ride, though, was not always comfortable. The tyres were freshly inflated to help preserve maximum range and every bump, crevice and pot-hole jarred right through bones as I did my best to negotiate my way across the less well-maintained stretches of the road. But even in the gusty wind the bike felt every bit as solid as my old vfr400, a testament to the stability offered by the massive intertia of the 47 Kilograms of SLAs that glued the bike firmly to tarmac. As the journey progressed the first (green) LED started flashing, vanishing a few miles later. This was followed by the second flashing green LED. As I reached the ten mile mark, paranoia crept in about the load on those not-so thick phase-wires and I pulled in briefly at a layby to feel them through the underseat hole by the breaker switch. But I needn’t have worried, they were only mildly warm. I also felt the case on the motor, and – though hottish – felt more like the side of a fresh mug of tea than an oven ring. Eventually, after forty minutes of driving I arrived in my old neighbourhood of Sneinton and sought out the familiar burgundy door of the street we used to share. By this time the third (orange) LED was on solid and I was getting as far into draining the SLAs as I like to before giving it a good charge. I planned to give it a four hour charge, the 72V equivalent – roughly – of the three-hour boost charge they talk about in the Ego’s publicity blurb. I figured that way, even if the range wasn’t actually improved by the extra batteries, due to technical considerations I don’t fully understand, a four-hour charge should buy me the extra 7 miles (over the 25-ish I expected from a full charge) that I needed to get the 32 miles total that I thought the trip would take, there and back. But alas it was not to be. The Burgundy door was there but the jungle of plants that usually fill the window were strangely absent. And even more ominous, not a single motorbike of any kind was parked outside. Peering forelornly into the bare interior I only saw the bare boards of a stripped and abandoned edifice. All that was left of his presence was just a few somber scraps of the stickers that had for so many years adorned the inside of his windows. Amongst them the iconic ‘Think Bike’, slightly dog-eared and sun-bleached. Only this and the horrible ancient wallpaper in the front room gave this place away as his former abode. I bemoaned the fact that both of us were too intermittent in our reunions to hold onto each others phone numbers for more than a short time. I did at least have a scrap of paper somewhere with his email address on it, so I could learn what had become of him. But I wondered somberly if I hadn’t lost it in one of my paper culling clearouts, possibly convinced that he and his wife would be spending the rest of their lives in that old terraced house. But my most immediate problem was the 3rd, orange LED on the battery level meter, which would itself go into blink-mode any time soon. I felt like someone out of Logan’s Run and needed a recharge. Fortunately I had considered this contingency when reading the Electromotive charge point network map. Nottingham does indeed have no less than two charge points, both residing next to each other on the white level of the Victoria Centre Car Park. Parking isn’t cheap, but fortunately it was Sunday and so they had an all-you-can-eat price of £4. And let’s face it I had no choice. I didn’t particularly fancy grinding to a halt five miles and a good few hills away from home. I was not too surprised when the guy at the car park info desk told me that he didn’t think they had any EV charge-points, but I insisted that he did and he duly picked up the phone to call for help. Talking privately on the phone he uncertainly dug into a drawer and pulled out a long blue, coiled connector of some sort and took out some other things. Then he hung up and came outside with the connector, a sheet of laminated instructions and a plastic wand of some sort, directing me to go to the same point on the level directly below, where he would meet me. He duly met up with me, but then muttered something and wandered away, and I was left looking around for what I expected the charge point to look like. I didn’t see them at first as they were hidden behind the sides of set of lifts, but wandering around the area I eventually saw the two yellow posts and EV sign, went back, got the bike and parked it up beside one of the posts. A little red LED strip on top of each was lit, and a flippable cover on the front with an indentation in the bottom was clearly designed to actually lock plugs in place so that they could not be removed. Good idea, I thought. Eventually I noticed the guy with the stuff coming back from whereever he went and wandering around looking slightly lost. I called him and pointed him to where the charge points where, hidden from view of much of the floor, and he came over and started trying to figure out how to use the powerpoint. Eventually he figured out that waving the wand over some sensor unlocked the panel and exposed the socket. Then he started fiddling about with the cable he had. The socket on the post was an ordinary three-pin, and the lead he had I could now see was was an adaptor for a big connector on the end that is presumably the accepted standard for the charge sockets on electric cars. He offered it to me, but I said it wasn’t necessary, as my charger goes into the ordinary three-pin direct. I left the charger locked under the seat with the lead trailing out to connect with the post. The guy waved his wand over the post again, and the panel locked over the plug, the row of LEDs on the charge post turned green and little message came up saying “charging”. Finally I was set. I said goodbye to the car-park guy, and went into town to kill the four hours I was going to give myself while it charged. The centre was far busier than I thought it would be on a Sunday, almost everything seemed to be open. All except those cool shops like Ice Nine and the other little places around Hockley, presumably because it wasn’t cool to be open on a Sunday. The weather was good though, and I whiled away the time seeing what had changed between my visits. The big council building in the main square was covered in scaffolding, and Nottingham’s underused Hard Rock Cafe had given up the ghost and shut down. Supermarket mini-markets like Tesco metro seemed to be popping up everywhere but little else looked different. Eventually I made my way back to where I’d parked my bike at about 3 p.m. The meter was back to the full-charge first green LED, but I knew this measurement couldn’t be relied upon straight after its ‘boost-charge’. It was the ‘heavy’ kind of voltage that quicky slides down as the electrolyte solution settles back into a more even mixture. The journey back was every bit as blustery as the one there, and the LEDs dropped off more rapidly now. By the time I re-entered the boundary of my home town I was down to the last, sixth, red, flashing LED. I’d set the profile on the meter to the most sensitive one, so I knew that the reading I was getting was an over-cautious one. On the ordinary default profile I was still on the solid orange No.4 LED. Both of these indicated that I was down to 11.9V or less per battery and well on my way to running out of power. When I pulled into the space outside my flat, I was still going strong, though, and there was little of the underpowered feel you get prior to it giving out totally. The odometer said I’d done a total of 34.4 miles, which wasn’t too far off the 31.8 mile estimate given by google maps, but it did make me wonder how accurate the odometer was on these machines, particularly since the bigger wheel on the front would make my bike underestimate mileage in comparison to how it was with the stock wheel. Since it seemed pretty accurate based on my journey, I can only surmise that the clocks usually overestimate mileage by a significant degree. So there’s one way of keeping the mileage lower, bigger tyres! This all of course raised the question that I really wanted answered, and that is what approximate range I was getting out of my 72V bike per charge. and I reasoned thus: Based on the 8-hour full-recharge time of the 48V model, it would be fair to say that 50% more capacity would equal 50% more full-recharge time. If a full charge for the 72V is 12 hours, then it stands to reason that a four hour charge is a third of the capacity, and therefore range. The approximate range for a full charge extrapolated from the range I got, or would get before it finally conked out at 11.6V (as it did in an earlier test) would therefore be about three-quarters of the range I got with the top up charge. P.S: There was a spot of good news after my trip to visit my vanishing friend. A couple of days later that elusive bit of paper turned up when I was clearing out my desk draw. I can at least email him now and find out what became of him. Going round a steep, downhill bend last week, I came perilously close to losing the front wheel when I had to brake sharply. Fortunately I straightened the wheel out before I lost it completely, but it left me less than enamoured with the dodgy Chinese tyres that come with the bike. Part of this may be down to the added weight of those two extra batteries, but it left me feeling that the tyres really were something of a weak link on this bike, and so I set about looking into a quality replacement. Others reported having gone for a slightly wider fitting, and the “Continental Zippy” was mentioned a few times. But I couldn’t find this in the wider fitting so settled on the Continental K62, a close relative also referred to as the “Zippy 3”. As usual, I ordered on-line, and one was soon on its way. A few days later it arrived and I immediately dashed over to the motorbike shop to get it put on. I even drove there and just took the wheel off in front of the shop. My heart sank a bit when the bike guy I’d asked to refit it said “it’s bigger than the other one, it’ll probably not fit and rub against the mudguard”, but my impression of the pretty sizeable gap (and the veracity of people’s reports in the forum of this tyre-size being fine) won out and it went on without any trouble at all. They look more chunky and a bit more respectable (despite my reservations about the lack of swirlies), and actually raise the ride height by and inch or so. The mudguards were clearly placed where they are with bigger tyres in mind, IMO. I noticed straight away that the speedometer’s accuracy is not quite as wildly overstated. It now seems to be more like 12-14% out, rather than the 17-20% it was before. The most important thing, though, is the sure-footedness of the ride. There was a brittle, precarious quality to the ride before, and the sense that the bike would quickly betray me unless I treated sharp bends or uneven surfaces with the greatest respect. Even with just the one tyre on, it feels much more forgiving now, reminding me of a similar experience with an old VFR400 I had many years ago. 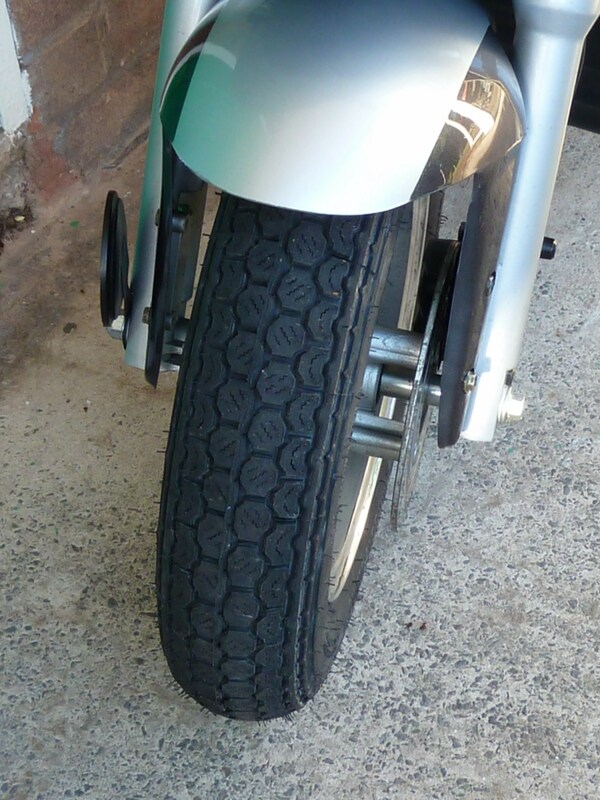 After a spill in wet conditions I took advice and changed the very poor, (again) Chinese – tyre on the front wheel for something of much greater quality, and it immediately transformed the bike’s handling. This reinforces the old adage about the tyres being the most important part of the bike. Rubbish tyres mean rubbish handling. So even though the tyre was pretty inexpensive, it still feels substantially better than the chunk of cheese that it replaced, and I’m nothing like as nervous about leaning into bends more than a tentative few degrees from the vertical. So I also plan to replace the back wheel with something of equal caliber. But I have concerns about the impact of the larger size on the acceleration, particularly with that rather too gentle ‘soft start’ that makes pulling away from a full stop a little too leisurely for my likes. But the effect of that extra 4cms or so is very much open to debate. Is the “soft-start” purely dictated by speed, as given by the motor’s hall sensor, leaving that side of the acceleration pretty much unchanged, or will its impact be noticably adverse? Does an extra 10% diameter also up the top speed by a similar amount? In time-honoured tradition I’ve ripped off yet another idea: Adding a little flair to the final product. However, while Ian favoured the stock ‘Turbo Sport‘ motif, I have gone so far as to assemble the entire three letters required for my own catchy sub-heading – a stroke of genius, non? (Stick-on chrome lettering available here). The ‘Ego’ sticker will have to go, though, I’ve decided. I’ll have to find some cool, chrome futuristic-type logo to go in its place. Possibly like some emblem from Stargate SG1, but not as nerdy. The wires all come out of two separate holes at the end of the controller case, rather than one big one in the middle. 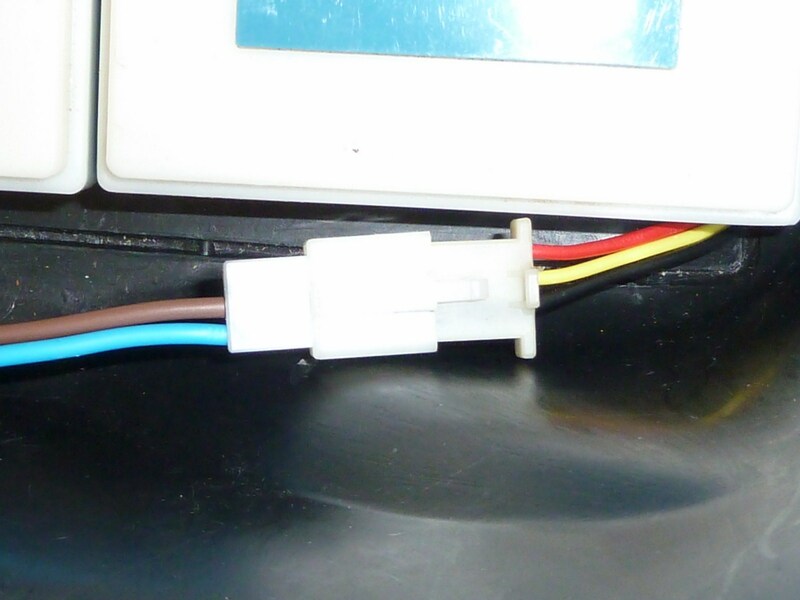 There are no ring connectors for the phase wires, just a 4-way ceramic block much like the one used for the main motor power wires on the 48V factory bike. Chatparts.com, assure me that it does indeed come with regenerative braking, which – they say – will just spring to life as soon as I connect it up. 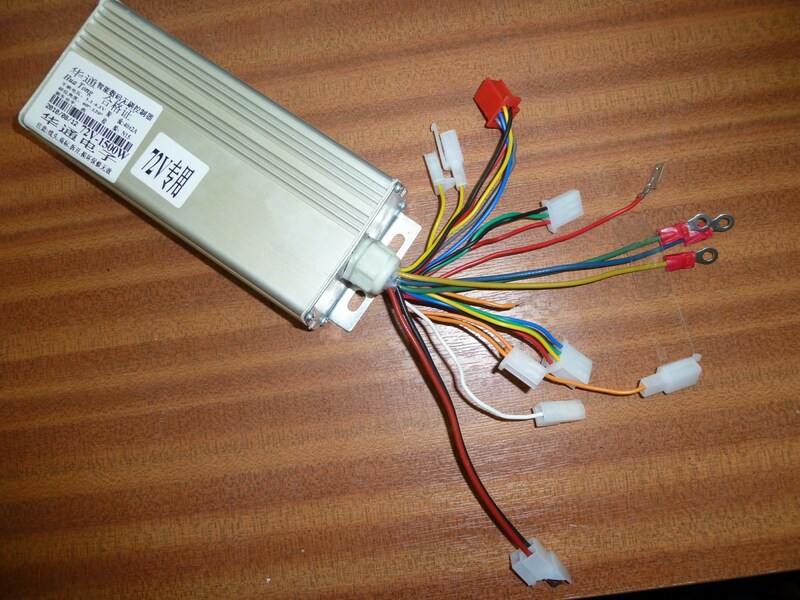 Most important, though, is one thing that was very much the same as my existing 72V controller – the big banana-skin of that throttle connector with the reversed wires. 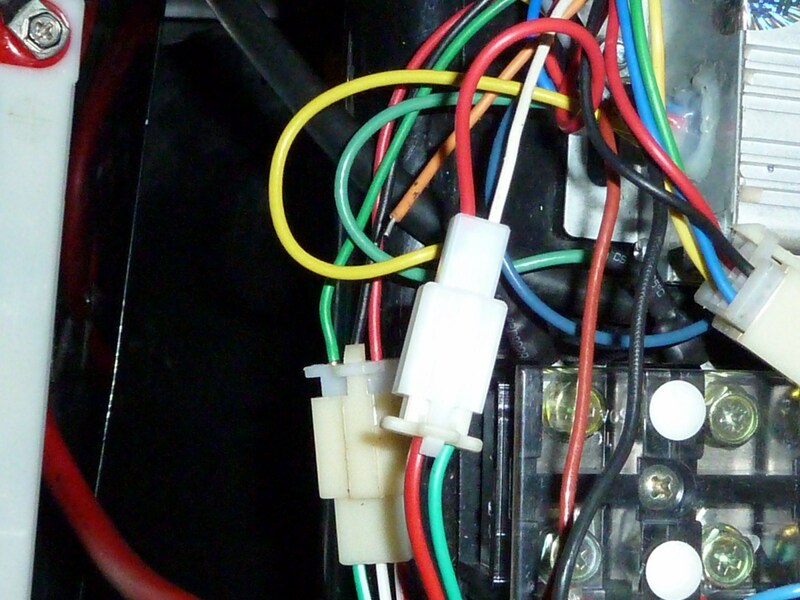 Just like the other 72V controller, the Green(/White) – Black(/White) – Red(/White) throttle connector on the loom (bottom), corresponded to the Black-Green-Red on the controller’s own connector (top). This should be Green-Black-Red, NOT Black-Green-Red, so that they match their counterparts on the loom. On both occasions, the black and green wires on the controller’s three-way connector needed ‘picking’ so that these wires could be reversed. Thanks to the Dharma of Mike and Ian, I was spared the Red Herring of switching around phase wires at random (which seems to be the first response of choice to a completely dead system), and had this throttle wire problem pointed out to me straight off the bat, courtesy of Ian’s kindly-volunteered phone tech-support. Rumours are abound that there is sometimes a problem like this with the phase wires (even though each is specifically colour-coded) but I’ve not seen this on either of the controllers I’ve now tried out. With the chatparts.com controller I was also left with the same useless (for the Ego’s purposes) plastic three-way connector housing the main motor power wires (left & right), and the low current power supply for the controller (top), which shares a two-way connector with the brake cut-off wire on the old 48V controller. 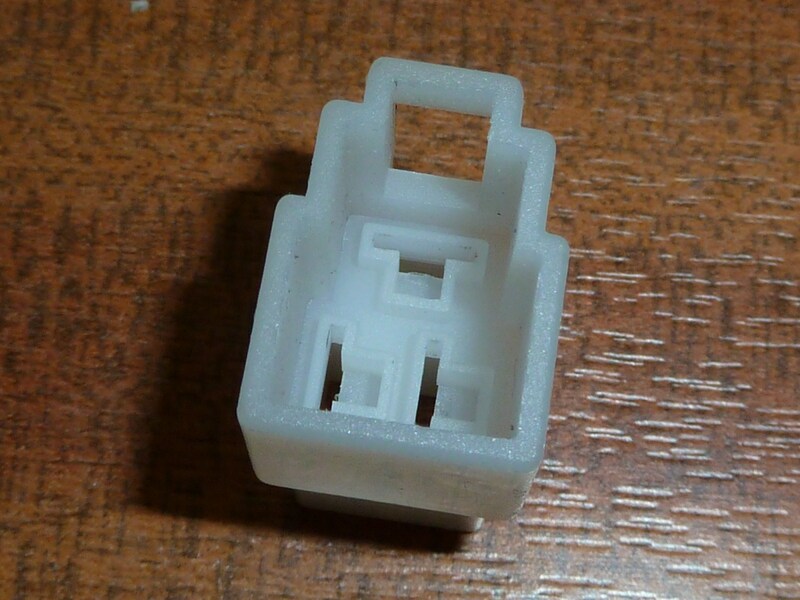 I am certain that both of these plastic connectors will still be lying somewhere in my toolbox when I’m 93, – too potentially useful to discard, but too actually useless to ever realistically find a function for. The main power wires that used to live here were dutifully rigged up to another Anderson connector as described in my previous entry, and the controller power-feed was put aside for when I put on a proper connector to replace the existing, temporary one. First thing, though, was to take care of the phase wires, which – once removed from the useless ceramic block – were just bare wires requiring the 6mm ring connectors that the ego’s junction block is all set up for. The problem is, of course, that the smallish guage phase wires are way too small to suit the large bore of a standard 6mm ring connector. They are just the right size, though, for one of the many bullet connectors in my handy megapack of connectors. The final stage was to do a proper job on that two-way connector that serves the controller power-feed and the brake cut-off. If you recall, I’d settled for a bit of a dog’s dinner of a temporary connection to tide me over until I had some more mini-connector bits. 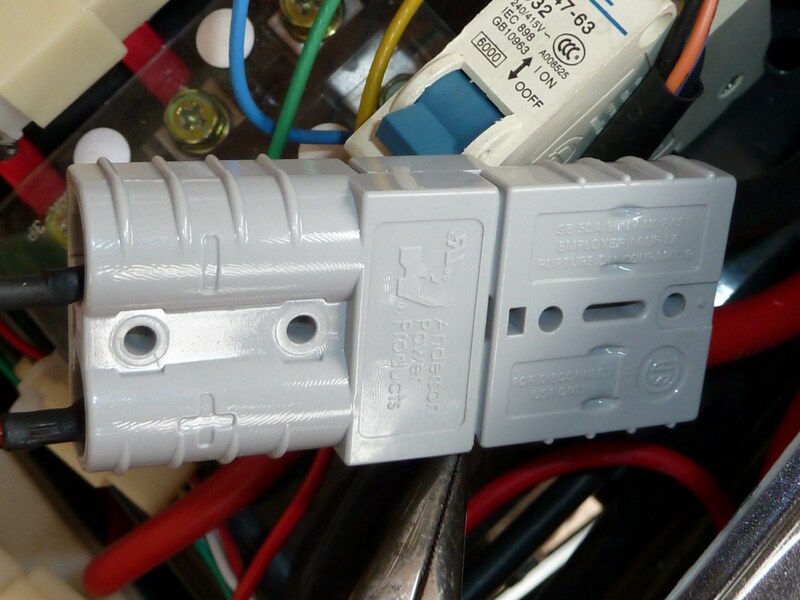 A proper connector replaces the red/violet two-way that ran from the old 48V controller, and which now holds the equivalent red/white connections from the 72V controller. Once I’d remembered to connect my makeshift 12V cable, everything came to life just as it had before, and I was hoping to finally experience the long-awaited phenomenon of regenerative braking. Alas it was not to be. The bike ran, handled, and made exactly the same noises as it had with the old controller, but there was no sign of any of the torquiness that is supposed to accompany the regen function. The “oh, just plug it all together and it works” claim was evidentlly untrue, and despite a total of ten or so emails to the sellers of both of these controllers, I have yet to be furnished with any useable information that might yield a clue as to how to enable this function – even my English translation of that Cantonese schematic coud not unearth any mention of regen braking. You are currently browsing the Zenid's Ego Scoota Blog blog archives for September, 2010.